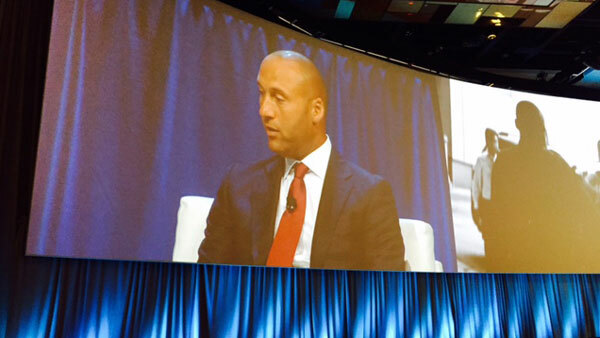 Pershings Insite conference was full of high-profile speakers and big-time announcements, but the now-retired Yankees captain stole the show. Derek Jeter was one of the hit speakers of the conference. There were multiple announcements made by Pershing during its Insite conference, which ran Wednesday through Friday: its multi-pronged solution to the robo-advisor ‘problem,’ including a deal with robo-advisor Marstone; a partnership with digital content provider Vestorly; a big-data application on NetX360 called OpportunityView; a suite of tools called Managed360T with Lockwood meant to help advisors “scale” their managed account business. There were reports released by Pershing on advisor use of alternative investments and its third annual “Study of Advisory Success,” which focuses on advisors’ perception of robo-advisors (only 19% of the advisors surveyed thought digital advice could complement their practices; 23% saw robos as competition.). Plenty of big names spoke at general sessions during the conference: former Federal Reserve Board Chairman Ben Bernanke, interviewed by Pershing’s Gerry Tamburro; former Secretary of State Madeleine Albright, interviewed by Pershing Advisor Solutions’ Mark Tibergien; former Defense Secretary Leon Panetta, interviewed by Pershing’s Jim Crowley. But another ‘former’ person of note kept the record number of attendees in their seats until noon on the last day of the conference, even as storm clouds threatened Orlando, where Insite moved this year. That person was former New York Yankees shortstop and captain Derek Jeter, who — along with Bernanke and Albright and Panetta — received a standing ovation from the audience. Jeter was interviewed fireside-chat style Friday morning by Pershing CEO Ron DeCicco, a Bronx native whom Pershing Chief Marketing Officer Caroline O’Connell (who announced herself and her father as big Yankees fans) said grew up in the shadow of Yankee Stadium. In an hourlong session peppered with film clips of Jeter playing (and appearing as a ‘Yankee wife’ on a Saturday Night Live skit) and still photos from Jeter’s youth and extracurricular activities, the former shortstop showed his devotion to his birth family, his Yankees ‘family’ and fans, and his own nonprofit — the Turn2Foundation — which helps kids in three different cities, including his home town of Kalamazoo, Michigan, stay drug- and alcohol-free. On how to achieve success: “You can’t succeed without experiencing failure.” His manager Joe Torre (who spoke at Insite last year) “gave me an opportunity to succeed, and to fail,” Jeter said.